One of the big things Laura and I like to focus on is providing great resources for our members. We’ve found this helps members have a better experience at Ironworks (this “secret” marketing strategy is detailed more in this funny post). Here is our current list of the programs and workouts you can do at Ironworks. 1. One basic 6-week program, ideal for beginners who do not have any strength training experience- click here to open in a new tab. 2. Two intermediate 6-week programs (one is 2 days a week and one is 3 days a week) specifically designed to help get you acclimated to the equipment at Ironworks- click here to open in a new tab. 3. The Equipment Database on this site. 4. The books around the gym. If you want to take one home to read, simply email us at ironworksgymbinghamton@gmail.com to let us know. 5. Exercise Index on EliteFTS.com. 6. Programs on T-Nation (like this Squat Cycle). 7. Bill Starr’s 5×5 Program (used by Derek Ferry, Kyle Kappler, Ryan Beckhorn, and Chris Payne). 8. Smolov Squat Cycle (used by me (Dickie), Tree Man, Tierney Wallace…it almost killed me). 9. Dave Tate’s Free Squat Manual. 10. Dave Tate’s Free Deadlift Manual. 11. Dave Tate’s Free Bench Press Manual. 12. Shieko Training Programs (used by a large number of people at the gym; probably the most used style of programming). Here’s a download to an Excel file put together by Chris Payne. 13. Dom’s meet prep for Squat and Deadlift. 15. 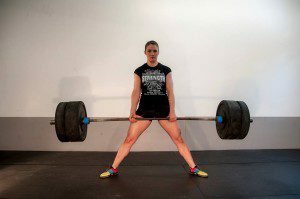 27 of the Best Powerlifting Programs, a site suggested by Justin DeMara. 16. Here’s a download to an Excel document put together by Chris Payne that calculates your weights for the Chad Smith Deadlift program that a lot of lifters are currently using. 17. 16 Week Powerlifting/Bodybuilding Program from Elitefts.com. And, we’re always looking to add more programs. So, if you have used a program and had success with it, or know of one that you think other members may enjoy, please email us to let us know about it. In addition to the programs above, Laura and I both offer personal training for individuals and small groups. To help new members become acclimated, we offer a discounted 1-on-1 training session to go through our Basic Program (click here to open the Basic Program PDF in a new window). You can add this introductory session to any membership purchased for just $25 (discounted from our standard rate of $50/session).